Great impact through rich media and video. Rich media and video formats engage users at a whole new level, drawing them in and encouraging interactivity in a way not possible with other ad formats. Choose from a variety of rich media formats, based on your campaign objective. Access DoubleClick Studio, a free rich media production and workflow tool. Analyze data on more than 100 unique interactions in every creative unit with Audience Interaction Metrics. Integration with DoubleClick for Advertisers, a robust ad management, serving and reporting solution, simplifies trafficking, reporting and billing of your rich media campaigns. If you’re already working with another rich media vendor, we have many approved vendors we work with. Create image, video (InVideo, Click-To-Play), Flash and rich media (including expandable) ads using hundreds of fully customizable templates or templates tailored for specific industries. Stay true to your brand with your own images, text, videos and logos. We automatically convert the ads you design into most standard IAB ad sizes. Display Ad Builder is also great for testing different messages and creative elements, or to get insights for more complex display campaigns managed by your in-house team or agency. Stand out by blending in. 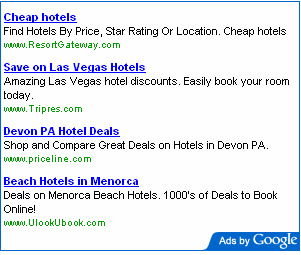 Text ads are a versatile ad format that are easy to create and edit, in minutes. They’re especially effective as an extension of your existing search campaigns. Simply opt your search campaign into the GDN and your ads will show to users as they surf relevant web pages via our contextual targeting technology. Text ads also complement display campaigns by engaging users who ignore display ads (i.e. banner blindness). Further, they give your campaign wider reach since not every publisher may accept display ads, or may only accept a limited number of display ad formats and sizes on their site. Whether your goal is to drive awareness, or to generate immediate sales, learn how the robust creative toolbox available on the Google Display Network can help. We’ll see you next week when we talk about how you can reach your audience with the targeting technologies available on the GDN.